June, July and August were very busy months as kitten season hit us full on. I worked with a farmer near Frome who had 4 kittens born to 2 feral mums, I successfully caught the 4 little kittens who were only around 4-5 weeks old and they went to Maria’s and have now been rehomed. Sadly, one of the mum cats had to be put to sleep because it had tested positive for FIV. FIV is a virus that is transmitted through biting, when the virus in the saliva of an infected cat is injected directly into the blood stream of the cat it bites. The next job involved a colony of 16 cats and kittens at a lovely elderly couple’s home in a rural location near Maiden Bradley. With the help of my daughter, Kellie we rescued 10 kittens from there and they went to Maria and Ricky to be looked after. There was another FIV case here so sadly, that cat was also put to sleep, but the remaining cats were neutered and returned and are being fed by the couple. Next was a job at Babington House Hotel where I trapped 5 more kittens and took them to Hazel, the 3 feral adults that were also living there were neutered and returned. The next job involved catching 4 more kittens who were living in a shed in Mells, the poor things were very scared, and I got a bite on the finger from one of them. They were all tamed and 3 out of the 4 have now been rehomed. At the beginning of September, I looked after 4 very newborn kittens who’d been found at Mole Valley. They were only around 2 days old, and, as it as a weekend and none of the local vets could take them I decided to bring them home and look after them for the weekend. After a very quick lesson in hand rearing from Maria I fed them every 2 hours for 3 days before they went to Lynda at the Weston-Super-Mare branch. Sadly, they didn't make it and they all passed away a week or so later. Just as we thought kitten season was over Mandy let me know about some kittens that were living in a garden in Frome. 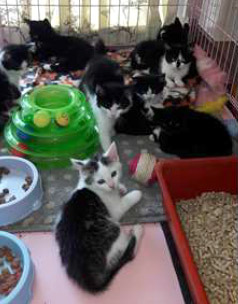 The garden they were in was an empty house that was being sold and the owner thought there were 4 possibly 5 kittens. I was able to trap the first 3 quite quickly and off they went to Maria. The last 2 were a bit trickier and had been seen in 2 or 3 other gardens nearby, so to try and trap them I had traps in 4 different gardens (with the owner’s permission). I had a call early one morning from one of the people that had a trap in his garden to let me know he had been able to catch one of the kittens by hand, he had seen another one, but it had been too quick for him, but it was off to Maria’s with number 4. The 5th one was a tortie and she did not want to be caught, she was definitely a naughty tortie!! With the aid of a fishing net (borrowed from Hazel) I finally managed to catch her late one evening and reunited her with her brothers and sister. So, as you can see it has been a very busy summer but very worthwhile, it’s so rewarding knowing that I have brought all these kittens into our care and helped them find some lovely new homes.